“Could you show me how to do that? A sort of blackwork for beginners lesson?” I asked my school friend, as an intricate black and gold frog was appearing from nowhere on her fabric. Then she turned the work over to fasten off her thread and I could hardly believe my eyes. There was another frog on the reverse! When I tried to embroider, I ended up with a tangled forest on the back of my work but her back side was as neat as the front. We spent a few lunchtimes together, with her trying to show me how to do blackwork embroidery. All too soon it was the summer break and our lessons had to stop, before I had mastered the technique. I must have been the only child, that year, who couldn't wait to get back to school. Only to find Julie had moved to a new one! I turned to my grandmother, who had taught me basic embroidery stitches. But she had never tackled blackwork. I asked my needlework teacher if I could do embroidery in class. She insisted that I make the same skirt that everyone else was stitching. Sigh! Is it time for me to teach you? Have you ever wanted to learn something new, but not had anyone around that could help? It is so frustrating isn't it? To have your heart set on learning a skill, but no way of finding a mentor to help fulfill that dream? In the end, I decided to teach myself blackwork for beginners. The stitches aren't difficult, but making the intricate patterns reversible was another matter! Sheer perseverance and hard work paid off, and I conquered the simplest patterns. But that wasn't enough for me. And I guess it wouldn't be for you? 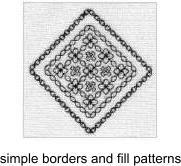 I wanted to devise a way to make the most intricate patterns easy for you to stitch. 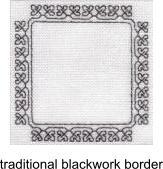 I wanted to be able to introduce YOU to the wonderful world of blackwork. I charted some blackwork for beginners projects and started teaching people just like you. 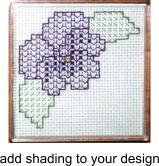 I taught at women's groups, local needlework stores and even major stitching shows. I met some wonderful editors at the shows, who commissioned projects for their needlework magazines. Blackwork was beginning to become popular and I couldn't have been happier. But I was only able to travel so far. There was only one of me, and I could only be in one place at a time. Then along came the Internet. A worldwide audience. Wow! Now I could teach you wherever you live. One show, at the NEC in Birmingham, sticks in my memory. I spotted a tall young man, with a shorter lady, standing off to one side. I invited them to join the class I was holding. "Oh, you have already taught me how to do blackwork," he replied. Racking my brain to place him, I just couldn't. No, I had definitely not had such a distinctive lad in any of my classes. Did I mention that he was TALL, well over 6 foot? He laughed at my confusion and went on to explain. It turned out he had completed all my blackwork for beginners Internet classes. But he wanted more from me. ..
"When are you going to write a book?" I hadn't considered writing a book before that meeting in Birmingham. But the seed had been sown. My mind was racing. My patterns, which I had been refining every time a question came up in class, would work in a book format. I could include my methods for making those patterns easy to follow. Of course I didn't stop there. I wanted the book to lead you through the basics and then on to more advanced techniques. I wanted you to feel that I was there with you, holding your hand as you progressed. 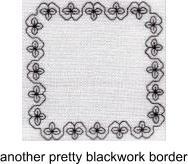 So what is in the book, Blackwork For Beginners? You will find out what threads and fabric to use. You will learn how to incorporate metallic fibers, hand-dyed threads and beads. You will become aware of how to choose the best pattern for each area of your design. You will see how adding extra stitches can create a shaded effect. Oh, and of course, you will discover how to make your work reversible! But the best bit is you don't have to wait by your mailbox for your copy of Blackwork for Beginners to arrive. You will be able to download it and get started straight away. But stop! Check out what others have said about the book. 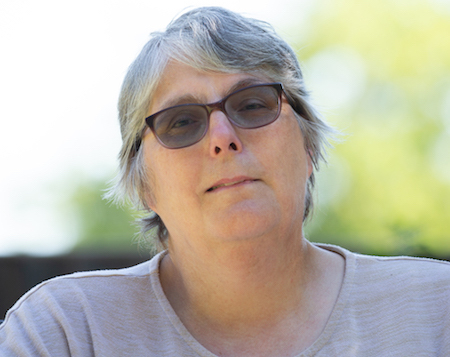 The way that Carol describes the minutest detail, you just know that she has "been there, made that mistake". You feel as if you are reading comments from a friend instead of a teaching manual. Jean, above, was one of the first people I taught how to do blackwork. She was the leader of a women's craft group that met about 15 miles from my home. I was so nervous that night! I must have done something right though, as they asked me back many times for more advanced lessons. After designing cross stitch patterns I was looking for something new. Something that was easy to stitch for young and old and I did design my first blackwork pattern. It was not what i expected. It did not look the way I wanted and I had no idea what I was doing wrong. Then I did see this book, Blackwork for Beginners, and buy it. For this small price it was worth trying it. I, like many other people, learned Blackwork the hard way by trial and error. I have been a cross stitcher for approximately 20 years and a friend bought me a kit of what she thought was a cross stitch design. Wrong, it was blackwork. Oh dear, what on earth is that, looked at it and put it away for a couple of years, to then bring it out and as I said by trial and error taught myself blackwork. 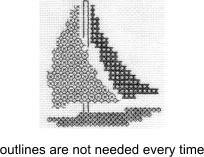 If only Carol's book, Blackwork for Beginners, had been around then. It is so full of good hints and suggestions. It is ideal for the beginner, from the very earliest stages to the more experienced stitcher. The explanations and the charts are well thought out and presented, they explain in detail how to follow the pattern at the same time giving you useful suggestions. Also for the more experienced the book helps you to understand how to "fill in" the patterns, once again with well presented charts and explanations. Carol's blackwork book is excellent! No-Questions-Asked Guarantee: If for any reason you don't find this book helpful, just email me within 8 weeks from your date of purchase - and I'll issue you a 100% refund immediately. You have 8 full weeks to read, practice and to stitch the projects. If you're not completely satisfied just ask for (and receive) a 100% refund. Order your copy of Blackwork for Beginners here.. So don't put off learning blackwork any longer. Click on the button below and you will soon be enjoying it yourself. Oh wait! I missed the most exciting part out! The price. The book will only cost you £9.95. Please note that if you are in the UK or EU then VAT may be added at checkout.